Have We Seen the Last of the Sesame Street Line? Over the past week or so, there has been a few mentions of line changes already for this up coming season. Unfortunately the ever so famous “Sesame Street Line” seems to be in danger of dismemberment. During Mr. Shero’s press conference on July 1st he stated, “To go out and spend our money for a supposed wingers for a lot of money or term didn’t make sense to us right now. Our chance was to focus on the defense and we wanted to add good players at the right age. I think that’s what we did.” As of the 8th Shero said, “We're just looking around to see if anybody fits, and we're keeping Billy Guerin in mind as well." Since Mr. Shero has yet to find a reasonable fit in a winger, the possibility of moving Staal to Geno’s wing or having Staal center the second line and move Geno to Sid’s wing has risen. Shero said coach Dan Bylsma can use training camp to determine the configuration in that scenario. Staal, who has developed into arguably the top third-line center in the NHL, played some on Malkin's flank on the second line earlier in his career. Malkin occasionally moves to wing on the top line with center Sidney Crosby. This brings up a lot of questions: Why not put Tangradi on Sid’s wing? 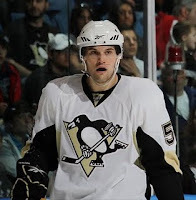 Why doesn’t Shero just re-sign Guerin? Why not make a trade? Why not moved Talbot to Geno’s wing (again)? Why split up arguably the best third line in NHL this past season? 1) Why not move Talbot to Geno’s wing (again)? Really, why not? Though we didn’t see the same Max Talbot as we did in 08-09 season. Max has worked well along side Geno. Max has the talent to be a second line winger, we have seen it before. I believe if he really works hard this training camp and get the shoulder going, he could find himself a permanent spot. 4) Why not put Tangradi on Sid’s wing? A lot of people have been calling for Tangradi to be Sid’s winger, but is he ready? Dan Bylsma will be able to decide that this coming week while Tangradi participates in Prospect camp. From personally watching the guy play in Wilkes Barre a few times, I’d say he needs a little more work, but that is my opinion. All players are different in their own terms. Who knows maybe one NHL game could have done the trick for him. "Why split up arguably the best third line in the NHL this past season?" Here is some food for thought on why we shouldn’t: Tyler Kennedy, Jordan Staal and Matt Cooke.